The food stall serves the various warriors, women, children and non-combatants in the encampment with food and drink; they do say an army marches on its stomach! Our staff are on hand to discuss , ingredients, agriculture, recipes and more. Viking food was very dull compared with the food we eat today. The most common foods were fish, porridge made from oats and barley mixed with milk or water, and barley bread. Bread was made from wholemeal flour, which was often dangerously contaminated. Weeds such as cornockle, which was poisonous, were often present, as well as stones from the quern used to grind the flour: the stones in the bread wore down teeth. Vegetable varieties were few and far between. The Vikings probably ate carrots (poor looking white ones; not the more familiar orange ones we know today), coarse-leaved cabbages (which they conceivably introduced) and onions. [Most of the vegetables we eat today have been produced using plant-breeding techniques developed over the last 100 years or so.] Vikings did not have potatoes, tomatoes or sweet corn; these did not arrive in Europe until after the 15th century. They did not have tropical fruits such as oranges, bananas, pineapples, coconuts and paw-paw. They made the best of what they had by using herbs and spices. Seeds of dill, coriander and wild celery were used to flavour soups and they used liberal helpings of sea-salt. Salt was also used to preserve food especially meat and fish. As far as fruit was concerned, Vikings ate apples, probably the crab-apple variety, plums, cherries and wild strawberries. The most abundant fruit available was the fruit of the blackthorn bush, sloes; and there is ample evidence to show that they ate these: rather bitter they sweetened them with honey. 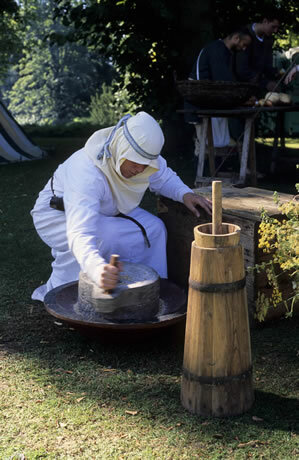 Grain was ground by hand between two stones (a quern) to make flour and only the wealthy could afford to eat wheat bread. The Vikings were fond of meat, especially beef, mutton and pork, although in truth the wealthier would have eaten more meat, as this was a popular ingredient of Viking diet. Pigs were killed when they were young when the meat was most succulent. Other animals such as goats, sheep and cattle were allowed to live their full life span because the Vikings needed their milk, wool and hides. Milk would be churned into butter and cheese throughout the year. Cheese would be salted so it would keep for longer. Small amounts of horsemeat were also eaten and hens reared for their meat and eggs. The main sources of food therefore, were vegetables and fish with occasional supplements of meat. Besides the meat from animals, Vikings used other parts. The hide from cattle and the fleece from sheep were important and bird feathers were used to stuff pillows and bed coverings. Horns were useful as tools and as drinking vessels. Bones were used to make needles, spoons and toggles for clothes. In the forests of England Vikings would have hunted deer and wild boar where possible and these hides also proved popular. Hares were caught to make tasty stews but there were no rabbits in Britain until the 11th century. Game birds were popular prey and these included black grouse, golden plover, wild ducks and geese. In Scandinavia, hunting was also a supplementary source of food. Bands of men went on long hunting trips especially in winter when families were tired of salted meat and food stocks were low. They sought deer, boars, bears, foxes and otters and killed them with spears, bows and arrows or set traps. The seafaring Vikings were fond of fish. In Scandinavia, they hunted seals and walruses and drove whales into shallow creeks to kill them. In Britain, they ate herring, salmon and eel in quantity and there is evidence that sea and fresh-water fish were enjoyed. Flounder, plaice, whiting and cod were certainly eaten in Jorvik and the fresh-water varieties such as pike, perch and roach. Herring, the most abundant of the sea fish, seems to have been the favourite. Fish of all types were plentiful as the Vikings were born sailors and always near water. Two specialty dishes, eaten on exceptional occasions, are worthy of mention - if one has a strong stomach! The first delicacy was putrefied shark. After catching and killing the shark, it would be gutted, cut into large pieces and washed. A large hole in coarse gravel would be dug (well away from inhabited houses as the smell was something akin to stagnant urine! ), and the fish placed therein, being pressed together firmly. More gravel and heavy rocks would be placed on top and left for about 6 - 7 weeks (3 months in winter), after which time it would be dug up, reeking of ammonia, and then hung in a drying shack for 2 - 4 months. It was then ready for eating. Puffin meat was treated similarly, and according to some sources, a refinement, included somewhere during the process, required Vikings to urinate upon the puffin, before it was dug up and cured! It was then ready to be eaten. (Yum Yum!) Fish that has been urinated upon is still eaten on occasion in Iceland today. Once they had grown or hunted food, the next problem was preserving it to eat at a later date and there were several ways of doing this. Meat could be salted to prevent it from rotting, but salt was expensive and scarce. Pickling food in sour milk or vinegar was another method but the most popular one was to smoke meat or fish by hanging it over a fire so that the heat dried it out and the wood smoke helped to preserve and flavour it. Meat and fish were grilled on long, iron spits and forks. The Vikings made butter and cheese from cows and goats milk. They also liked stews and used huge cauldron-like pots for cooking. These huge pots were suspended over the hearth by a sturdy chain. The Vikings were very fond of drinking beer, which was made from barley and hops. A strong beer called mead, made from honey, water and yeast was also very popular, so the bee-keeper would be an important man in the village. Wealthier people drank wine made from grapes imported from Europe, but this was a luxury and very expensive. Honey was also used to flavour food, as it was the only way available to sweeten things. Sugar was unknown. The Vikings usually had two meals a day. The first was in the morning and the main meal was in the evening. There was no 'lunch-time' as such, for to stop work during daylight would have been regarded as a waste. Food was eaten from wooden plates or bowls and they used spoons and knives, but did not have forks. Food was cooked using the open fire, which burned in the centre of every Viking house. The fire pit had an area where hot ashes would be scraped. This is where the cooking took place, not over the open flames, as this would scorch rather than cook the food. Meat could be roasted on a spit, over the fire or baked by wrapping it in leaves and burying it under the fire. 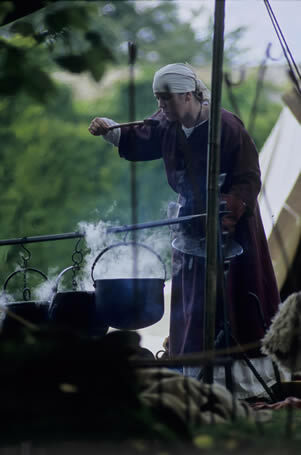 The best way to cook food was by boiling it in an iron kettle (or what we would call a cauldron) for a stew or pottage. A large bowl of stew would be cooking night and day in a Viking house so that there was always a hot meal for hungry workers. The flavour of food would vary with the time of year depending on which food was most plentiful. We're looking to improve this article in the near future to ensure accuracy. If there are any queries about, or possible corrections, for any of our articles please contact editors@vikingsof.me.